Sunshine Coast of Queensland, Australia. Enjoy the breathtaking views of the ocean and marina from the balconies of your well appointed apartment. Newport is a 16 level high-rise resort that reflects the relaxed atmosphere of the Sunshine Coast with spacious 1, 2 & 3 bedroom apartments and motel suites. Forget using the car, with our envied central location The Esplanade right below offers superb shopping, alfresco dining and romantic walks along the beach. Set on the Mooloolaba Spit, Newport is surrounded by a shimmering white sandy beach and a harbour alive with maritime activity. A haven for families, the Sunshine Coast offers safe beaches, unspoiled National Parks, subtropical hinterland and a variety of activities ranging from fishing and water sports to theme parks. LARGE & FULLY SELF CONTAINED, 1 QUEEN BED, 2 BATHROOMS & 2 BALCONIES with swimming POOL & GARDEN VIEWS. Across the road from the patrolled beach. 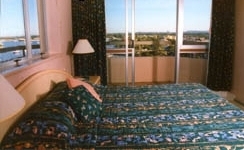 LARGE & FULLY SELF CONTAINED, 1 QUEEN BED, 2 BATHROOMS & 2 BALCONIES with magnificent OCEAN VIEWS. Across the road from the patrolled beach. LARGE & FULLY SELF CONTAINED, 1 QUEEN BED, 2 BATHROOMS & 2 BALCONIES with magnificent OCEAN VIEWS. Across the road from the beach. LARGE & FULLY SELF CONTAINED, 1 Queen & 2 Singles, 2 BATHROOMS & 2 BALCONIES with swimming POOL & GARDEN VIEWS. Across the road from the patrolled beach. 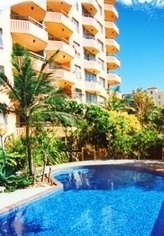 LARGE & FULLY SELF CONTAINED, 1 Queen & 2 Singles, 2 BATHROOMS & 2 BALCONIES with magnificent OCEAN VIEWS. Across the road from the beach. Huge & FULLY SELF CONTAINED, 1 Queen & 4 Singles, 2 BATHROOMS & 3 BALCONIES with swimming POOL & GARDEN VIEWS. Across the road from the patrolled patrolled beach. Huge & FULLY SELF CONTAINED, 1 Queen & 4 Singles, 2 BATHROOMS & 3 BALCONIES with swimming POOL & GARDEN VIEWS. Across the road from the patrolled beach. Huge & FULLY SELF CONTAINED, 1 Queen & 4 Singles, 2 BATHROOMS & 3 BALCONIES with OCEAN VIEWS from your north balcony & HINTERLAND, WHARF & MARINA VIEWS from your 2 south balconies. Across the road from the beach. Ground floor Air conditioned Studio suite, 1 Queen bed, kitchenette, separate bathroom & laundry facilities. Across the road from the patrolled beach. Linen provided, Studio suites are serviced daily self contained apartments are serviced for stays of 8 days or more. initial supplies of tea, coffee, sugar, soap, toilet paper, dishwashing detergent and bin liners to get you started. An arrival time must be provided on the booking form. The building is locked at 8pm. If arriving after 8pm, special arrangements are required to check-in. Please contact Newport Apartments directly using the phone number on your booking confirmation email. Extra Person Charge $33 per night roll-away bed and linen. $11 per night portacot and linen. Each apartment has one free undercover park available that is accessible by a security key. The Max height for entry is 1.93 meters. Ground floor Studio parking is off-street at the rear of Newport. Newport Mooloolaba Apartments are one hour north of Brisbane's International and Domestic Airport and 10 minutes south of the Sunshine Coast Domestic Airport. From Brisbane travel north along the Bruce Highway (Approx 1hr 15mins) and take the Mooloolaba exit, follow the signs to Mooloolaba and Underwater World (we are right next door to Underwater World). You will travel along the Sunshine Motorway Approx 20 mins, past Aussie World and Ettamoggah Pub. When you reach Mooloolaba you will be on Brisbane Road. At the Roundabout near the Shell service station turn right onto Foote street. Then turn left onto River Esplanade. Newport Apartments is located on the Corner of River Esplanade and Parkyn Pde at the traffic lights. From the North. Travel south along the Bruce Hwy and take the Mooloolaba exit and follow the above directions. Arrivals at the Sunshine Coast airport will need to turn right onto the David Low Way this road comes to the Sunshine Motorway follow the motorway south and exit at the Mooloolaba exit and follow the above directions (Approx 20mins). Newport Mooloolaba apartments is within walking distance to all the best attractions Mooloolaba offers and is a great position from which to explore the rest of the Sunshine Coast. Explore UnderWater World aquarium. Charter a boat to go fishing, watch the whales migrate or cruise the canals viewing the multi-million dollar homes in an old Brisbane River ferry. Experience Australia Zoo (Crikey! Its great!). Delight in Aussie World and the Ettamoggah Pub or get the adrenalin pumping at the Big Kart Track. A romantic experience not to miss is to enjoy the extensive "all-you-can-eat" seafood buffet aboard the "River Soiree". Glide effortlessly upon Mooloolaba's calm waterways enjoying the Seafood Cruise. Strolling along The Esplanade in front of Newport Mooloolaba will have you enjoying beachfront alfresco dining or indulge in retail therapy at the many boutiques, specialty stores and galleries. A discerning shoppers' paradise. Indulge and play at the safest beach on the Sunshine Coast. Walk the beachside board walk down the Mooloolaba Spit where you can feast on famous Mooloolaba prawns, fresh fish and seafood served direct from the trawlers. There are numerous day tours operating from Mooloolaba. You can follow the wine trail, shop at the World-renowned Eumundi Markets or experience the spectacular views of the legendary Glass House Mountains and the remarkable Blackall Range and visit the hinterland townships of Montville and Maleny. A little further north we come to the world heritage listed Fraser Island and Cooloola National Park offering a natural unspoilt paradise. All accessible from our tour desk. Which is your choice Share with us a slice of paradise.